I was back in the Pittston Area again for a little gathering they call a "Diaper Party" which is essentially a baby shower for the new dad to be. 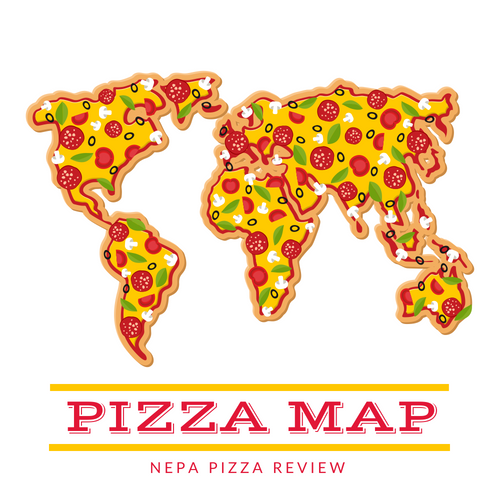 If you haven't been to one, it provides a great reason to order pizza and review it with a large group of friends. After we delivered our diapers and cracked a frosty beverage, our pizzas arrived hot and fresh. Since I wasn't the person who picked up the pie, I can't tell you much about the physical restaurant building, but I can tell you about the pizza that they offer. Let me just say that being a pizza critic having 10-15 guys watching me and asking questions while performing a pizza review without my laptop to take notes was a ton of pressure! At this point, I'd have to consider myself a seasoned veteran, so I thought I was up to the challenge. First up, I tried the New York Style Pizzas which were extra large as described, and the 12 slices made them great for the party. 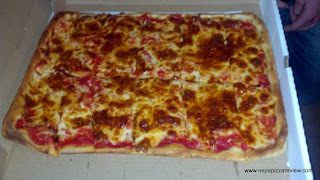 Both of the New York pies were well constructed and made properly with nice proportions of sauce and cheese. One of the pizzas was a bit undercooked, and the other was cooked just right. From the top down, the cheese was your typical mozzarella, which was pretty good. The sauce was fairly decent, but was a bit too sweet and the texture was too fine, and there was no integrated, full-bodied flavor that the great New York Style pies have. This doesn't make it a bad sauce, but there was nothing that really set the sauce apart from the rest of the pies in NEPA. This was evident in the tepid yet generally positive feedback from the fellas around the room. 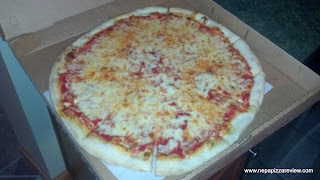 Finally, the crust was a bit thicker than some NY pies in the area. It was pretty fluffy, and only slightly on the chewy side. I'd have to say the crust was my favorite component of this pie. 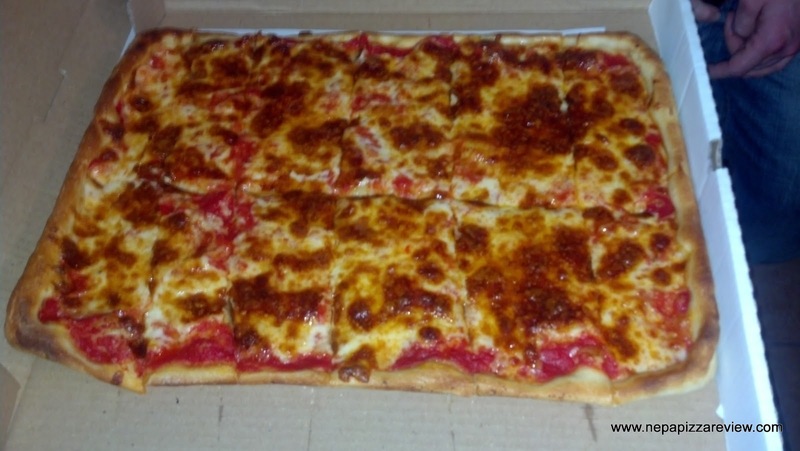 After the pressure-packed review of the New York Style pizza was complete, it was time to turn my attention to the Old Forge pizza. When we opened up the box, the thing that caught our attention first was that the cheese was pretty heavily browned all the way across the top. After trying the pizza, I concluded that this was probably a mixture of mild cheddar and mozzarella cheeses. I did enjoy the blend of these two cheeses, and they are a bit unique to put on an old forge pizza. Unfortunately, the sauce on the Old Forge was the same as the sauce on the New York. If you have read any of my previous posts, I'm pretty adamant that NY sauce is not cooked ahead of time, and OF sauce needs to be precooked in a pot on the stove. The crust was pretty decent, although I would have liked if it was a bit lighter and fluffier to contrast against the heavy cheese combination and to offset the flavors and texture of the sauce. Overall, I'd have to say that both of these pizzas are average and they did serve their purpose in a party setting, which is exactly what I would recommend this pizza for. Additionally, my Luzerne County pizza expert recommends you get the garlic balls as an appetizer if you do go to Napoli's.